MIAMI | In its August 2018 edition, the Florida Catholic published questions and answers with Father Alfred Cioffi regarding a change in the wording of the Catechism of the Catholic Church. Father Cioffi recently wrote this article, amending his initial comments about the change in the catechism. Father Cioffi has doctorates in both moral theology and genetics and has been a priest for 33 years. He is the Blue Cross-Blue Shield Endowed Chair of Bioethics in STEM at St. Thomas University in Miami Gardens. On August 2 of this year, Cardinal Luis Ladaria, prefect of the Vatican’s Congregation for the Doctrine of the Faith, declared that Pope Francis had recently amended the Catechism of the Catholic Church regarding the death penalty. The canon in question is number 2267. The next day, I was asked by the Florida Catholic newspaper to comment on the matter. In that article, essentially, I defended the long-standing tradition of the Church regarding the application of capital punishment by legitimate civil authority as a means of last resort to protect the civilian population from the possible escape of a convicted dangerous murderer. 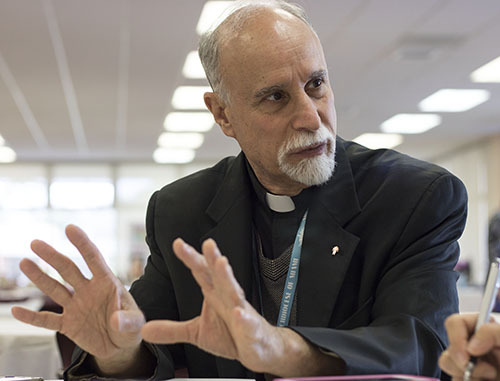 Father Alfred Cioffi, who has doctorates in moral theology and bioethics, is associate professor of biology and bioethics at St. Thomas University, Miami Gardens. First, the doctrine of capital punishment is seen within the context of development of doctrine. Catholic doctrine is indeed dynamic, and allows for legitimate development. Not just a re-phrasing of the same teaching in more contemporary language, but rather a deeper penetration and elucidation of the layers of truth contained within that doctrine. So the Church has now come to understand that marriage is not just primarily for begetting children, but rather for the mutual enrichment of spouses and for procreation, up to par with each other. In fact, without this deeper understanding (development of doctrine) childless couples — due to no fault of their own — could be hard-pressed to find meaning to their marriage in God’s eyes. In the United States, in 1971, Cardinal Humberto Medeiros, then archbishop of Boston, introduced the phrase “consistent ethic of life” to mean precisely to respect and cherish human life at all stages and in all circumstances. In 1983, Cardinal Joseph Bernardin, then archbishop of Chicago, expounded on this theme with what came to be known as the “seamless garment” argument; true prolife advocates also uphold the intrinsic worth of the born, even if they are not innocent in the sense that the unborn are. Third, as regards legitimate authority having recourse to the death penalty as a last resort to protect civilian population, this must be seen existentially. This is what I mean: Whenever there is life on earth — human and non-human — there is always some risk of premature death. For example: According to the U.S. Department of Transportation, there were over 37,000 fatal car accidents in the U.S. in 2016. According to the National Oceanographic and Atmospheric Administration, there has been an average of about 50 deaths from lightning strike over the past 20 years. Just stepping outside one’s home intuitively represents an increased risk of injury or death. Click on the image to read the old and new versions of No. 2267 of the Catechism of the Catholic Church. In view of these facts, how much less risky is life for the average person if all death row inmates were to be executed? To try to ascertain this question, one can make this calculation: According to Amnesty International, there were at least 993 executions worldwide in 2017. According to the United Nations, we were 7.6 billion people in the world last year. If all of last year’s executed death row inmates instead had escaped, that comes to about 0.000,01 percent of the world’s population. This means that the increased risk of injury or death from an escaped death row inmate today seems to be negligible for the average person on earth. In contrast, according to the World Health Organization, over 15 million people (0.2 percent of the world’s population) died in 2016 due to heart attack or stroke; both pathologies can be more correlated to unhealthy lifestyles than to the attack of an unjust aggressor. And finally, what is to me the most valuable prolife argument in favor of seeking to abolish the death penalty worldwide is this: It deflates the accusation of pro-abortionists and pro-euthanasia proponents that pro-lifers only care about the unborn. When we pro-lifers rally against capital punishment, we leave pro-choicers perplexed at our extremely high regard for the dignity and sanctity of all human life, including that of those directly involved in the largest genocide in the history of humanity — all because they, unlike us, fail to see and appreciate the humanity of the born and the unborn. Blessed Cardinal John Henry Newman, an Anglican priest who converted to Catholicism, in his book on the development of doctrine, wrote: “In a higher world it is otherwise, but here below to live is to change, and to be perfect is to have changed often.” In view of the fact that our Lord Jesus Christ calls us to be perfect as our Heavenly Father is perfect (Mt 5:48), I have changed my opinion to agree that, today, the death penalty is inadmissible, and that we should earnestly seek its abolition worldwide. Father Cioffi position on death penalty is a sign of quest for the truth in humility. St. John Paul II promoted the abolition of the death penalty because it was no longer necessary to protect humanity. Thanks to him, several prisoners are alive today. Pope Francis continued the same advocacy with one new step stating there were no legitimate exceptions and it should be completely inadmissible. Father Cioffi, a scientist himself adds new arguments from a persuasive culture of life. I dream for the day when Florida will no longer practice this obsolete practice of punishment. Dear Friends in Christ: I disagree with this article written by Father Alfred Cioffi. Ever since the amendment to the 1992 CCC (Catechism of the Catholic Church) was released several Catholic commentators, and theologians have desperately tried to defend the indefensible. Pope Bergolios amendment to the Catechism of the Catholic Church represents a complete and total rupture with Church tradition. 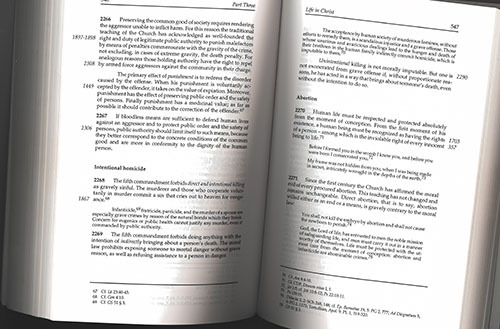 Let me explain: The first thing that leaps out to anyone who has reads CCC 2267 is this �the death penalty is inadmissible�. But the only support or evidence that is given for this change is an address by pope Bergolio himself! The reason being is that neither Pope Bergolio nor his theologians can find any real magisterial evidence or support for this new novelty. Even John Paul II who was a critic of the death penalty never changed or amended the CCC to state that it is inadmissible! Second, the amendment to CCC 267 completely shatters the continuity of the Church�s real magisterium. In my last post on this topic I quoted from the Roman Catechism of the Council of Trent, pt. III, 5, n. 4. Let me quote it again because it bears repeating: �Far from being guilty of breaking this commandment [Thou shall not kill], such an execution of justice is precisely an act of obedience to it. For the purpose of the law is to protect and foster human life. This purpose is fulfilled when the legitimate authority of the State is exercised by taking the guilty lives of those who have taken innocent lives.� Next let�s look at the teaching of the great Doctor of the Church St. Thomas Aquinas and what he teaches on the death penalty: �Now every individual person is related to the entire society as a part to the whole. Therefore, if a man be dangerous and infectious to the community, on account of some sin, it is praiseworthy and healthful that he be killed in order to safeguard the common good, since �a little leaven corrupteth the whole lump� (1 Cor. 5:6).